Bake them, mash them or roast them -- no matter what you do with your favorite spud, rest assured you'll be getting plenty of nutrients. 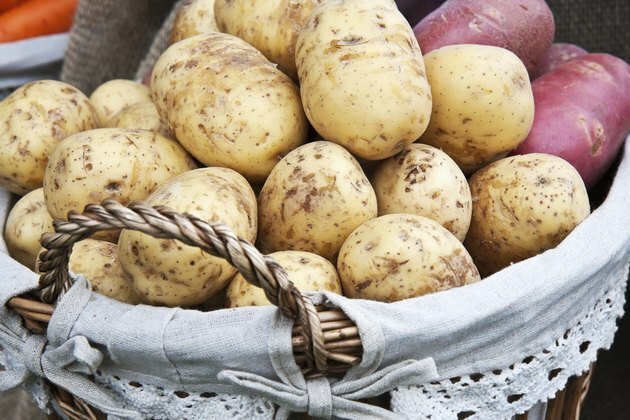 Even though russets and red potatoes have many similarities -- amounts of potassium, phosphorus, magnesium and most B vitamins -- they do have several differences. Depending on what nutrients you're looking to get from your steamy side, one may be better for you than the other. Calories don't vary drastically between russets and red potatoes. A medium-sized russet, weighing a little more than 6 ounces, contains about 170 calories. The same size of red potato offers closer to 155 calories. Each type of potato has a similar breakdown of calories, with 88 percent calories from carbohydrates, 10 percent from protein and less than 2 percent of calories from fat. Russet potatoes have 25 percent more fiber than red potatoes. You'll get 4 grams of fiber from a medium 6-ounce russet, versus only 3 grams from a similarly sized red potato. You need 28 grams of fiber for a 2,000-calorie diet, or 14 grams for every 1,000 calories, the Dietary Guidelines for Americans 2010 points out. So, if you do opt for that russet, you'll get nearly 15 percent of your daily fiber requirement for 2,000 calories. But that red potato has just 10 percent of your fiber needs. Vitamin C keeps your immune system going and keeps your skin healthy. Potatoes probably aren't your go-to food when you're thinking of ways to get more vitamin C in your diet. However, you'll get at least 15 percent of your recommendation from either variety. Women require 75 milligrams of daily vitamin C, which goes up to 90 milligrams for men, the Food and Nutrition Board of the Institute of Medicine states. Your 6-ounce russet gives you approximately 14 milligrams of vitamin C. Opting for a red potato instead provides over 30 percent more -- nearly 22 milligrams from a 6-ounce red potato. You need vitamin B-6 to metabolize protein into amino acids, stabilize your mood, regulate your appetite and to protect your heart. Russet potatoes provide double the amount of B-6 as red potatoes. As a woman, you need 1.3 to 1.5 milligrams daily, but if you're male, you require 1.3 to 1.7 milligrams each day. Having a 6-ounce russet offers you 0.6 milligram, or over 35 percent of your daily needs. You'll get 0.4 milligram from a red potato that is the same size, which provides at least 23 percent of your recommendation for the day.